I am an inveterate collector of sewing books. New, vintage, encyclopedic, obscure, I love all of them. I like them on all topics, from embroidery stitches to types of fabric to projects and theme volumes. I’ve been asked repeatedly which books I most recommend, and have put together a list of those I feel are most worth the investment and time. 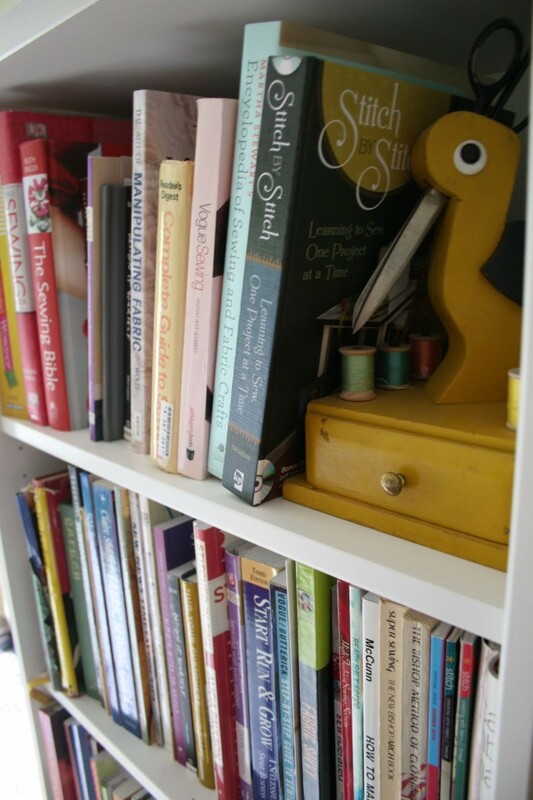 The number of amazing project-based books out there is so enormous that it deserves a blog all its own, so I’ve listed here only the titles I think should be in everyone’s sewing library, and which will do you the most good. I’ve starred the ones I go to most frequently, and which I’d have a tough time getting by without. Sew Everything Workshop by Diana Rupp–Well-written by someone who clearly has spent time one-on-one with students who are new to sewing. Includes cute patterns, but the real power in this book is the instruction. Sew U by Wendy Mullin–The only other learn-to-sew book I have found or had the willingness to recommend. Again, clearly written and presented with thought given to how students like to work. I’m not in love with the illustrations, but I like her voice and approach. The Bishop Method of Clothing Construction by Edna Bryte Bishop–A classic, and the originator of the term “stitched to perfection.” If you like to make clothing, or if you like things to be Just So, this is a must-have. *Stitch by Stitch by Deborah Moebes–Shameless self-serving promotion? Probably. But I do honestly and sincerely believe that it’s the best way to learn to sew: with projects that will give you enough instant gratification to stay motivated, and that teach skills that build upon one another. *The Sewing Bible by Ruth Singer–Gorgeously photographed and with clear instructions. Covers a huge range of techniques, with some small projects at the back that, while they seem like a bit of an afterthought, are very pretty and inspiring. The Sewing Book by Alison Smith–A Dorling-Kindersley book, so it’s stunningly photographed. Another wide-ranging reference. Gives you plenty of techniques to learn or apply, but no instruction as to where to use them. I like that it inspires me to find projects on which to try new skills! Vogue/Butterick Step-by-Step Guide to Sewing Techniques–Illustrated in a manner very similar to their sewing pattern instructions, this is a handy reference to have on the shelf for any time you get stuck in constructing a project from a store-bought pattern, as it allows you to decipher some of the less-than-well-written instructions. Vogue Sewing–Very similar to the title above, but this one has a fabulous introductory section that covers body style, flattering design, how to measure, pattern alterations, and then launches into the skills in clear sections with ideas for application. **Reader’s Guide Complete Guide to Sewing–My could-not-live-without reference, for reals. Every technique under the sun, fantastic instruction and illustration. Makes no effort to teach you when and where to use the techniques, so this one is strictly a reference, but it’s endlessly useful. It is essential that you get a copy published prior to 1974–all the later editions cut out up to 100+ pages of the text and add little of value. Martha Stewart’s Encyclopedia of Sewing and Fabric Crafts–A collection of projects and techniques used in her magazine over the years. I was a little disappointed in this new title because it’s not really encyclopedic so much as a massive collection of inspiring projects, but it’s SO pretty, and who can ever stay irritated at Martha for long? I have sticky notes marking the pages I want to attempt–lots of them. Fabric Savvy by Sandra Betzina–While in need of an update in terms of the projects pictured as samples for each fabric type, I have found this invaluable when working with a new fiber. Large layouts give you info on needle type and size, edge finishes and project ideas for dozens of types of fabric. I personally love the elastic-waist leather pants. How to Make Sewing Patterns by Donald McCunn–This is very much a textbook and not for the faint of heart, but it is exceedingly well-written and thorough, and covers all the basics of drafting and altering both men’s and women’s garment patterns. *Design-It-Yourself Clothes by Cal Patch–Vastly more accessible than the title above, this one is great for all levels of skill. Her voice is very elder-sisterly, and her instructions are supremely clear and articulate. Great sample projects that somehow both inspire you to shoot for the stars and make it all seem totally within reach. The Art of Manipulating Fabric by Colette Wolff–This one could probably go under encyclopedic references, but since it deals strictly with how to fold, gather, roll, or otherwise alter the fabric itself, it’s really a specialized book. I love flipping through and seeing the hundreds of techniques all modeled in simple muslin, so you really get an idea of how the fabric of your project itself can be changed. Sew U: Home Stretch by Wendy Mullin–By the author of Sew U (above), this is really the only book about sewing with knits available on the market that covers the topic well and in a voice that makes you want to read it. Most other books on knits were published 30 years ago. This isn’t my favorite style in terms of the projects she presents (a little too genuine 80s for me, with the dolman sleeves and all), but a great way to get started with interlock and jersey fabrics. Have I missed something? 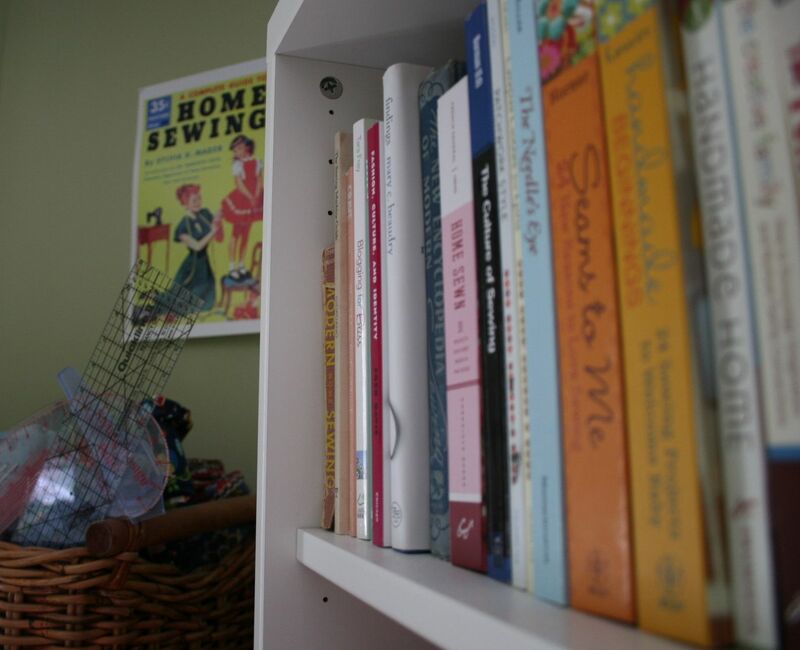 I’m always looking for a new title to justify another bookshelf–let me know in the comments which sewing books you love the most! I think I’ll just send a link to this page as my Christmas list! Thanks – it’s always nice to know a book is tried an tested. The Art of Manipulating Fabric by Colette Wolff is one of my all time favorites. I never look at it without being inspired. Fantastic list, I’ve been thinking of adding to my library of mostly fashion-school reference books so this comes at a perfect time! Thanks for this list! Very handy for a new sewist. There is More Fabric Savvy, which seems to be an updated second edition, though I haven’t seen Fabric Savvy. Or do you prefer the first version? I don’t have More Fabric Savvy. I got the first volume used via Amazon, and it’s met all my needs so far. Might have to look into the More version, though, since now I’m wondering if I’m missing out! so good job. GREAT JOB!!! and thanks for adding another title to my list of things that i really want and should have as soon as possible.